Mikronite is the strongest trace package in the Foliars+ product line. Trace nutrients are essential elements in the construction of amino acids, peptides and proteins within the plant. Trace elements are typically very immobile in most turf environments. 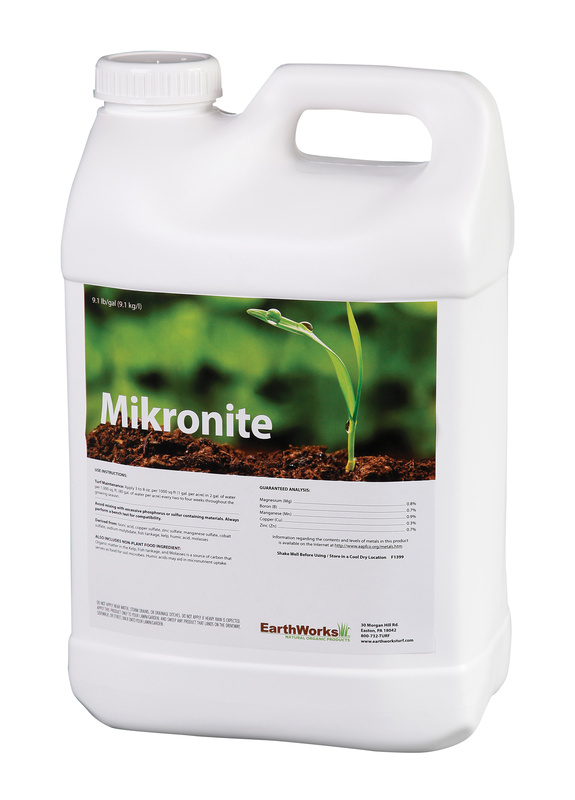 Mikronite, with its carbon base, not only provides a host of needed trace elements but the carbon allows for increased microbial activity helping to improve nutrient uptake. Trace elements act as the “spark plugs” that fire the engine of enzyme production needed for photosynthesis, protein production and synthesis and translocation of carbohydrates. Trace elements are important in the creation of plant protective compounds known as “phytoalexins”, an antimicrobial family of secondary plant metabolites necessary for immunity against insect and diseases. Mikronite focuses on boron, copper, zinc, manganese, cobalt, and molybdenum and de-emphasizes iron because of the excessive amounts of iron found in most turf soils. Manufacturing of the EarthWorks liquid products starts first with excellent water. We use only reverse osmosis water so that no minerals can chemically react with the ingredients in our formulas. The result is water that is absent of total dissolved solids, alkalinity, carbonates and conductivity. The water is then further treated so that the water molecule can be expanded as far as possible to allow it to become fully saturated with the diversity of ingredients that go into the Mikronite formula. The recipe is then loaded through a process called “stacking”, a proper sequence of mixing that creates maximum saturation of the water by the nutrients, to allow for ingredient compatibility. Finally, the products are micro-screened in order to create a non-plugging filtrate for trouble free applications. The EarthWorks Foiliar+ products are highly engineered products. They are developed to work synergistically with each other and with other nutrient based products. Applied on a “small but frequent” basis, Mikronite will become a staple in any turf management program.